One of the distinct pleasures of used-book sales is finding an old book about which you know nothing, and making a cheap gamble: a literary bet that the story will prove worth the coin. You hope it pays off with unsuspected greatness, but for me as a reader the bet’s covered if I find something memorably strange. Not necessarily greatly strange, but eccentric, interesting, and outside the received narratives of literary histories (and genre histories past). Which brings me to Helen Simpson’s 1933 novel The Woman on the Beast: Seen From Three Angles. And then there’s The Woman on the Beast, which is strangeness of a different order: science fiction mixed with Christian fantasy. A preface lays out the theme — “that the most hateful actions are, as often as not, performed for the best of reasons” — and states that the book’s three stories have only that idea in common. After a prologue set in the dark ages, the three stories in question follow, set in India in the sixteenth century, in France during the Revolution, and in Australia in 1999. Then there’s a brief epilogue, depicting, as you might expect from the title, the Apocalypse. But which also makes clear that the three stories have more than theme in common. The prologue’s set in the Dark Ages, when a king of a “Western Kingdom,” having adopted Christianity on his deathbed, is nearing his end. The bishop who converted him promised him a crown in the afterlife, but an angel informs the bishop that this won’t be possible. The bishop then works out a way to cheat the king while keeping to the letter of heaven’s law; and as the story works itself out, there are devils and a flaming comet and the birth of a hermaphrodite who will appear in the later stories of the book. The first of the main stories, then, follows the Grand Inquisidor of Goa, a dedicated religious man who is zealous in uncovering false idols, but who by bad luck stumbles into a series of misfortunes culminating in a Heart of Darkness-like journey to a ruined jungle city to meet a strange religious hermit. The second story follows a young French nobleman in 1789, who is both in love with an actress and involved in a secret society that might save France from a revolution. As in the first story, things end unhappily: the plan to save France fails, though it appears that the head of the secret society is the same hermaphroditic figure that we glimpsed in the first story. The last tale’s set in a 1999 defined by a religious dictatorship. Starting in Pharoah, California, a Christian sect led by a now-familiar androgyne spread across North America and went on to conquer the world — bombing Rome, and using weather-control technology to flood Ireland. Now they control everything except Australia, itself divided between Irish Catholics and fiercely Protestant Orangemen. The story follows a spy in Australia seeking conversion, but who, as happens, is herself converted to strike back against the society that raised her. The epilogue that wraps up the book directly follows the end of this story, and ties back to the prologue, explaining how the final triumph of the hermaphroditic prophet ties in to the betrayal of the King of the West. They were led through the black night a little way, past an erection that gave out liquid sounds of dropping water, past old squares of brick a foot or so high that had been the foundation of houses, to a village of this wandering people. Perhaps two hundred old rickety planes lay wing to wing, arranged in a pattern; between them there were streets, and in the centre of the pattern a good-sized square, at whose eastern end stood a large plane of special character, its wings curiously painted with ancient religious designs. No time was allowed for the inspection of this, and the system of lighting did not in fact permit of much investigation. The weary visitors, trailing their bags, or shifting them from hand to hand, incuriously followed their guides through the maze, while the crowd, now throwing out occasional comments or snatches of song, followed the visitors. In the morning they attend a religious service under the wings of the large plane, and see that the paintings are images of Saint Sebastian and Saint Lucy. It’s a striking idea. In the context of the book, the nomadic people of the planes are used as a science-fictional recasting of the wandering Jews; but I find there’s something about the way technology and mysticism are blended in the one image that resonates beyond the story. I haven’t been able to find much biographical information about Simpson online, but what I have come across seems to suggest interesting echoes with the text. 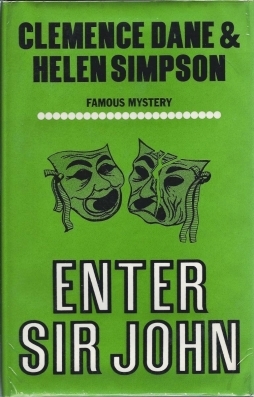 The novel has an ambiguous presentation of Catholicism, and a sense of the bitterness of interdenominational conflict; it’s interesting to note that Simpson’s father was Anglican and her mother Catholic, and that they separated when she was young — her going to England in 1914 was a reunion with her mother. Her mother was also the daughter of a French Marquis, which makes one wonder about the section of the book dealing with the Revolution. 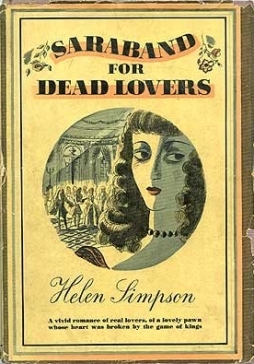 And the article on Simpson in the Australian Dictionary of Biography mentions that demonology was one of her “principal interests,” and that she collected books on witchcraft; you get a sense of that fascination with the occult in her depiction of magic in India, and of secret societies in France, as well as in some elements of the general atmosphere of The Woman on the Beast. Which is not to say that the book’s got a credulous tone, or accepts magic as straightforwardly as Dion Fortune or Charles Williams. The preface’s description of the book as being concerned with how “men are driven to persecute and betray, not by malice or folly, but by the good they passionately wish their fellow men” tells us that these stories are fundamentally ironic. At its best, the book follows through on this promise: the stories twist in interesting ways. Unfortunately, it falls short in other aspects. Character, notably, feels rudimentary. Even the main characters of the various sections feel flat, underdeveloped. To an extent that follows from the overall weight of the book’s irony, which is not always subtle. It also, I think, follows from an unsubtle conception of setting — I’m not terribly convinced by Simpson’s depiction of sixteenth-century India or eighteenth-century France. Above all her prose is unmemorable, lacking in striking detail and variety of rhythm; in large quantities (the book’s just shy of five hundred pages) you notice that it’s also none too concise. 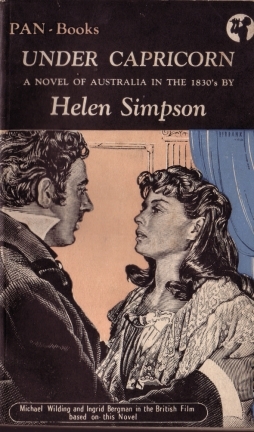 Helen Simpson serves both God and Mammon; she is romantic and literary, intelligent and popular all at once. 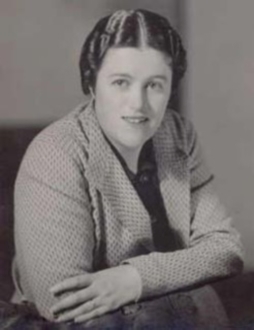 … Where the Australian realist renders life penny plain, she gives it to her readers twopenny coloured. … The glamour is handled with so much gusto that it is clear Helen Simpson herself is a romantic by instinct as well as by profession. … Her romanticism allows the authoress to catch the thrill of adventure, the atmosphere of an age, the bright colouring of fantasies. But it has a theatrical, artificial, even meretricious side to it. The sensations sometimes seemed forced. Life is dressed up for the part, and it is only a show, even if it is a good show. The romanticism of the book is perhaps less obvious to twenty-first century readers, as the ‘romantic’ or fantastic has become more prominent, even pre-eminent, in our fiction and culture. But the perception of flatness and artificiality is I think accurate. 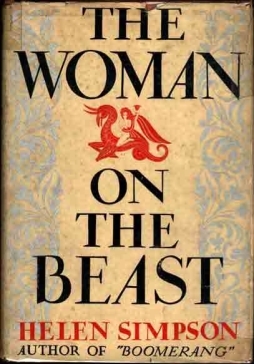 At its best, that characteristic actually works in favour of The Woman on the Beast: it emphasises the book’s oddity, its real strangeness. I don’t think it’s a strangeness that appears often enough for the book to be truly memorable, but it’s frequent enough that it does make for a book worth noting. Overall, Simpson’s book reads a little like a more ponderous G.K. Chesterton, with less wit and none of his paradoxes. That still leaves competent work, and one that’s occasionally surprisingly imaginative. But it’s very much a product of its time. Eighty years on, it’s a curiosity. But if that sounds like damning with faint praise, it still says that the book rewards the reader: curiosity has value. Picked up for a few dollars, it covers the bet, not with a spectacular payoff but with the fascination of the previously-unknown now uncovered.